All photos in this post courtesy of my mom! My dad overheard a Dressage spectator say "They shouldn't let horses like that in the ring, they earn 5 points right off the bat just for being cute." First time showing at the Kentucky Horse Park - AMAZING. Derby winner Go For Gin got frisky in his paddock and ran next to me and Connor for a second as we hacked back from Dressage warmup on Friday night. Ahhhhhhhhhh! Totally cool. Could have done without the Paso Fino World Championships going on at the same place though - you ever seen this in real life before? It's terrifying to the other horses. So many eventers were losing their minds over tons of little Pasos vibrating around the complex with these giant men on their backs, sounding like little jackhammers. Wild. Anyway! I was not expecting a lot out of Dressage at this show. Since the first week of September we had done TWO Dressage rides (and that means two rides in the loose ring instead of the elevator). I hadn't run through my test, (though I rarely do), and I hadn't felt that magic feeling in Connor's Dressage in a while. I love braiding so much. It's like meditation. I will do any of your braids for you, any time! I knew my trainer would be with our most junior rider in Show Jumping right before my ride, so I got to work on my own, thinking she'd be there soon. I ended up warming up almost entirely on my own, which was nerve-wracking, but ended up okay. He felt in front of my leg and obedient, but lacking sparkle, and I didn't know what to do to get it. Luckily my trainer ran in when I was on deck and told me to let him go a little bit in the reins to gain the sparkle, and that was the last advice I got before I went in. Personally, I felt like the test was workmanlike compared to Fox River Valley, and I can't wait to see the video my mom has - maybe I've been going for the wrong feeling in Dressage all along (or the judges looked at us differently.) At FRV I was obsessive about figures (and still got dinged for them), practiced the canter-trot downward transition on a straight line endlessly, and had him so on my aids and in tune to me, he forgot the rest of the world existed. But I did let go with the reins, using my shopping bag elbows and trying to align my body correctly. My trainer said the test was a lot less tense on his part than at FRV, and that must have been the key, because the judge wrote "Harmony and partnership clearly shown! Well balanced ride". Positive comments were straight, steady tempo, well-balanced, prompt transition, correctly ridden through turn, and stepped to balanced halt. Negatives were 'a little tight in neck', 'a little tight through neck & back', 'little stiffening' (see a trend? ), and 'should maintain stretch down and forward' in free walk. Even still, she only gave me one 6 and the rest were all 7s and 8s. Happy scratches from my trainer. My dad meeting Connor for the first time! Hacking back with this random girl. This was taken minutes before both of our horses were spooked so badly by the Pasos, we re-routed a different way back. We ended up tied for first with a 28 after Dressage - new best score for us! WOW a 28 way to go!!! That is so cool! It's a magical place. Thanks! Connor is adorable! A 28 is awesome. Congratulations! I have not seen Paso Finos like that before. That's gross! Thanks! Gross is definitely the word for it. My vet was competing at Jump Start too, and she said she used to be a vet for a Paso stable in Florida, and it's "really hard on their suspensories". No surprise. Well done, he looks great in the photos! You guys look great, and Connor is so shiny and RED! Yes, September, the one month of the year when my horse's coat is not clipped off or faded orange. Need more events in September! Haha, thanks, my mom asked how I knew to turn around at that second and I said "27 years of knowing you!" Thanks! It seems so surreal after all that time! Yes, it was AWESOME to have them both there! Thanks! Thanks! It's fun to share my excitement with you all! ahhh the elusive 'harmony' comment - way to go! great pics, and congrats on that awesome 28!! Our first experience with Paso Finos was at KHP also - first time Alexis competed at Dressage Regionals. Wild, aren't they? That's funny, what a place to see them. They are unlike anything I've ever seen, and I had even seen the championships on TV before, they're just so different in real life. Thank you! Well first off, CONGRATS and you guys look fab!!! Secondly, those Pasos are such bizarre creatures. I can totally understand why normal horses would lose their marbles. Yikes. Thank you! Yes, they're crazy, and it's a testament to the horses that more weren't concerned by them. I think it was more the noise than the sight. Your braids look really nice too...I've got to start practicing. Haha, so you're saying California should be the first place I look? Thanks, repetitive tasks are soothing to my brain, so braiding is the top of that list. Jeeez those pasos are crazy! I've never even seen videos of that before. I also laughed really hard at your description of them, leading boyfriend to ask for an explanation. As usual, it seems, my attempt fell short. 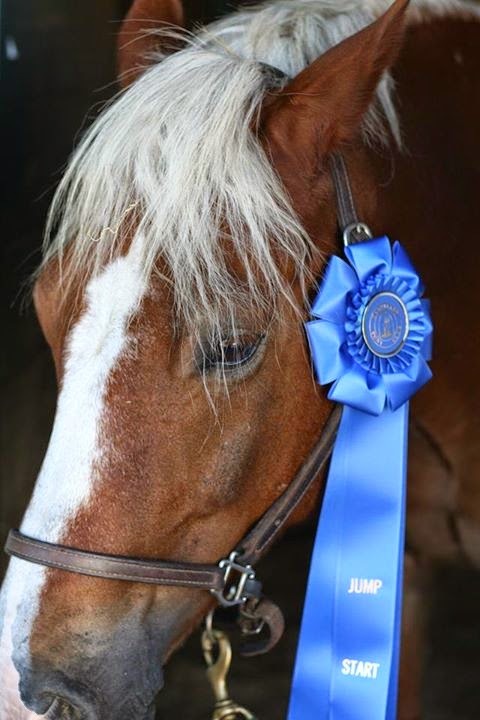 Also that's an awesome score, your braids are beautiful, and your horse is freaking gorgeous. Like straight up beautiful. I love my thoroughbred, but there's something to be said for that fit stocky look. okay, a LOT to be said for it. They are crazy, aren't they?! That's funny! He was pretty silent about the whole thing, but did watch Dressage. He only got nervous when Connor did a cat crouch spook when a lady on a scooter skidded to a stop on gravel covered concrete next to us. We both handled it fine, but still, had to remind him. I know what you mean about Thoroughbreds. I love them too, but there's something about a round neck. Paso Finos are a very strange breed of horse. They move their legs so fast and yet they don't really go anywhere! They always kind of remind me of wind up toys. Congrats on the good dressage score, and that would be so cool to see Go For Gin running next to you. Wind up toys is a very good way to describe it. Thanks! I wish I had pictures of Go For Gin, it would have been beautiful since it was sunset. What an AWESOME introduction to Connor for your dad -- you should be one proud momma!! I am! Now he has to come to every single one right? How awesome to get to compete there...congrats on your dressage win!